Which Krytox lubricant product is right for your application? Krytox perfluoropolyether oils and greases are available in a variety of grades for many types of applications. This Product Selection post provides general properties and cites the technical data reference document where additional information can be found. Typical Krytox lubricant applications include: paint plant conveyor bearings, corrugator and paper machine bearings, robotics, welding machines, high temperature fans, textile equipment, tenter frames, high temperature ovens, conveyor systems in glass and aluminum plants, textile calendar roll bearings, brick kiln car bearings, valve lubrication, ventilation fan bearings, rod mills, valves, valve actuators, automobile alternators, viscous fan clutches, pumps, sealed-for-life bearings, critical equipment where failure cannot be tolerated, and severe service applications. 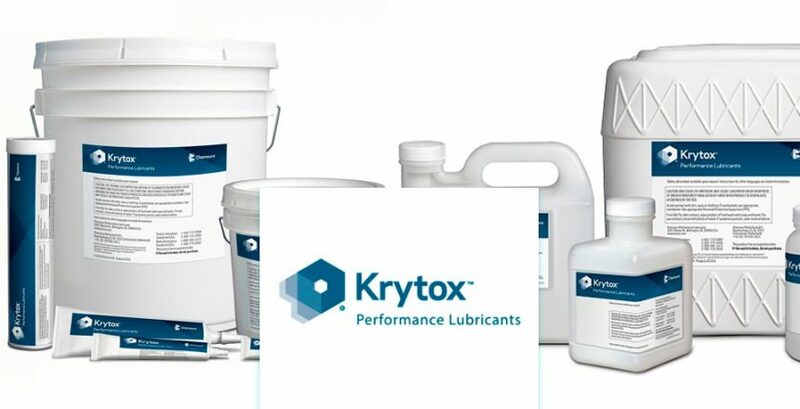 The Krytox GPL 10X oil /20X grease series contains no additives and can be used on components that may come in contact with all chemicals, including acids, bases, solvents, and other reactive chemicals. Typical applications include valves, bearings, seal barrier fluids, instruments, and oxygen systems. The Krytox GPL 21X series contains molybdenum disulfide for extreme pressure (EP) conditions and should be used for slow speed or heavily loaded applications. The Krytox GPL 22X series contains sodium nitrite corrosion/anti-wear inhibitor and is ideal for corrosive environments. Typical applications include automotive bearings, sealed pump bearings, electric motor bearings, and general-purpose bearings. Krytox 143 series oils are clear, colorless, fluorinated synthetic oils that are non-reactive, nonflammable, safe in chemical and oxygen service, and are long lasting. Krytox 240 series greases are white, buttery greases with all of the same properties as the 143 series oils that they are made from, but in a grease form. Krytox 240 AZ, 240 AB, and 240 AC meet MIL-PRF-27617 general specification. Krytox vacuum pump fluids are used in vacuum pumps and vacuum systems where controlled vapor pressure, non-flammability, and non-reactivity are needed. Krytox vacuum pump fluids can be regenerated and reused. Krytox XHT- AC and XHT-ACX greases are high temperature greases that contain anti-corrosion/anti-wear inhibitors. These greases are designed to work best at temperatures over 204 °C (400 °F), but under 300 °C (572 °F). Krytox XHT- BD, XHT-BDX, and XHT-BDZ greases are designed for use where temperatures are in the 288 °C to 399 °C range and there is a danger of melting the standard PTFE thickener. These greases use a special non-melting high temperature thickener that also provides extreme pressure properties and works as a solid lubricant if the base oil is depleted. The grease is slightly tacky, and it will coat the surface and stay in place. For additional information, refer to Krytox XHT Grease with Special Non-Melting Thickener. Many factors affect the performance of a grease and bearing, and those factors can affect grease and component life as well. Standard grease consistency is NLGI Grade 2 penetration. Sometimes, a harder Grade 3 grease or softer Grade 1 grease is needed and can be ordered. For example, softer Grade 00 or 0 greases are often used in gearboxes. In bearing applications, different types of bearings place different stresses on grease; ball bearings cause little stress, whereas roller bearings will tend to grind and work the grease severely. This stress can shorten grease life and require more frequent re-lubrication or result in the need for more viscous base oil in the grease. This Product Selection Guide is a starting point to help in the selection of the Krytoxâ„¢ lubricant suitable for your tough applications.